Sometimes I’m too smart for my own good. Okay, a lot of times then. I belong to a fair number of Internet boating forums; sailing, power, boat design and boatbuilding are just a few of them. Last year, around the middle of March, the discussion on one of the boat design forums turned to paddle boats. Not those one or two seaters you paddle around the lake, but real boats with Mississippi sternwheeler type paddle wheels. The discussion revolved around designing a smaller one for private use in somewhat sheltered waters. I followed the ebb and flow of the email conversations and looked at some of the web sites mentioned. At the same time I was looking at the calendar and realizing that April 1st was approaching. As usual, I put two and two together and came up with five. I use a CAD program to do the illustrations for my “how-to” columns and soon put it to work making some preliminary designs for a small stern wheel powered boat. It was addictive. As the design took form, I added more and more details. Then the brilliant idea struck. I would go ahead and do a more finished drawing and release it as a new design on April 1st as a spoof. So that was my plan. I finished the drawing you see here and came up with a name that sounded like it belonged to a character boat. “Winton M. Green”, my middle name, my father’s middle initial and my mother’s maiden name. It sounded good and seemed to match the boat. I sent the drawing and text off to a couple of publications. Most didn’t respond. One said they wouldn’t touch it with a ten-foot boat hook as the last time they did something like that they were bombarded with inquiries from folk who didn’t understand the joke. That should have told me something but it didn’t. One on-line publication did pick it up and published the drawings and my email address. BIG mistake. I immediately began getting messages asking detailed questions about the design, the power plant, performance figures, when it was going into production and how much it would cost. I saw your drawing of the Picnic Paddlewheeler on Duckworks. I have been looking for plans or at least a starting point for a paddlewheel boat for the shallows of Biscayne Bay here in Miami. I also live on a fresh water canal, which sometimes has an abundance of seaweed, where it would be more of a novelty, but still make it through the seaweed without clogging the impeller which happens to our jet boat. I have found several resources and even plans for smaller paddlewheeler boats, but no firm hull offsets for something of the size of your Picnic Paddlewheeler. I am curious as to how far you have gone in your design. I would be interested in seeing more details about it, such as draft and displacement as well as top view profile. Not only didn’t the reader get the joke, they were mad at me because the design wasn’t finished, wasn’t available and wouldn’t be in production. The on-line magazine even added the drawing and text to their archive, so I’m still getting inquiries. There I was, with a design for a new genre of boats, the “Picnic Paddlewheeler”, a ton of inquiries and no boat to sell, all the result of trying to pull an April fool’s joke. That’ll teach me, at least until the next time. If you have noticed the lack of nautical humor here on The Virtual Boatyard, there is a reason. It's on our sisyer-site www.purgatorycove.com. Visit there to follow the exploits of Sam. Lefty and Wade, proprietors of Purgatory Cove. We changed the name of our boat and found this ceremony in one of our old sailing books. Please don’t be offended by any part of it. Sailors are a superstitious lot and changing the name of your boat has been called a risky proposition. Too cavalier an attitude might anger the gods. Therefore it is customary to go through a de-naming ceremony before renaming. So here we go! “Christina” first took to the water in San Francisco Bay in the late 1970s. She sailed well and kept her crew safe. Later she changed coasts and sailed the Atlantic from her new homeport of Little River, South Carolina. 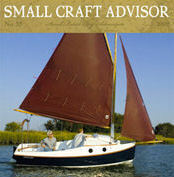 She sailed the coast, served as a floating home for a while and cruised the ICW until her owner found other interests. We found her in the Coquina Harbor in 1997. We brought her here to Tennessee to begin her life anew. So, in honor of her past life and in accordance with seafaring traditions from time immemorial, we ask Zeus, god of thunder, Poseidon, god of the oceans and Aeolus, god of the winds to witness the renaming and rededication of the fair ship “Christina”, bless her and all who have sailed in her. It is now time to rename and rededicate her. Let all gathered here witness the rededication of this vessel to the care of the Seas and the Winds. May she never anger Typhoon and may Zephyrus, Boreas, Argetses and Auster favor her in proper turn. May the Sirens sing her not to wreck but to safety and may the gods be pleased with her new name. Your name is now “Bryn Awel of Bristol”. May the Gods be pleased wherever they find you and favor you with their care. Fair winds and following seas. In England it is customary to name the houses. Bryn Awel was the house of maternal grandparents near Winchester, England where I lived for the first seven month of my life. It is Welsh and roughly translates to “Windy Ridge”. The custom of christening a ship with champagne is an affectation of the Victorian era. In earliest times, ships were christened with the blood of a virgin. Since they are in short supply these days, red wine is the liquid of choice. It was time to go out and visit the boat. Never mind that the temperature was in the ‘teens, that the wind chill was in the basement, that Upper East Tennessee was in the midst of a cold spell the likes of which hadn’t been seen in years - IT WAS TIME TO GO OUT TO THE BOAT! The Latest News From Purgatory Cove - my latest book! Somewhere slightly south of the great Susquehanna River and north of the Elizabeth River lies the town of Paradise Cove. It’s an old timey kind of place with the feel of a waterman’s town, although fishing and crabbing are no longer much of a livelihood around these parts. Folks around here do still have that independent spirit and a dislike for new things (and people). Now the town has only two main industries, if you care to call them that; the Apex Fertilizer Company and Purgatory Cove Fish Dock & Marine. Of the two, Purgatory Cove can claim to have been here the longest. Originally founded by Sam’s dad before the Second World War, it is currently run by Sam, Lefty and Wade. Purgatory Cove staggers along from year to year. They sell some gas, sell some bait, fix some boats and run the marina as they see fit. This is to say, not very energetically or profitably. Sam comes up with a wild scheme to make money from time to time but they don’t usually amount to much. They do have an almost legendary, or at least infamous, cadre of customers who keep coming back year after year to suffer abuse from Sam and bungling ineptitude from Lefty and Wade. They’re not mean-spirited, just not your highly driven, type A personalities. In fact, Sam calls them type Z personalities, if you get my drift. The guys at Purgatory Cove are slowly becoming better known. A fellow from one of those boating magazine up north keeps putting some of Lefty and Wade’s literary scribbling in his magazine. It attracts a few visitors, who manage to find the place, but Sam, Lefty and Wade soon drive them off. And that’s the way Sam likes it. Somewhere slightly south of the great Susquehanna River and north of the Elizabeth River lies the town of Paradise Cove. It’s an old timey kind of place with the feel of a waterman’s town, although fishing, clamming and crabbing are no longer much of a livelihood around these parts. Folks around here do still have that independent spirit and a dislike for new things (and people). Where the H*&% is Purgatory Cove? We got no shirts, no shoes and no service! Well, it’s been a slow week here at Purgatory Cove. Mostly because we found out which gas storage tank Wade put the water in. Sure enough, we filled up the pickup and it hasn’t run since. Once we sell enough gas outa that tank to customers we’ll be back to good gas and we’ll be riding again instead of walking. Had a visitor come by last week. Saw his beard and thought he might be one of those hippies or such. As soon as he go out of his vehicle and asked for a cold longneck, we knew he was a good ol’ boy like us. Turns out he’s from one of those boat magazines up north. Every now and then he gets in his car and goes exploring. He was off this time looking for interesting places to write about. Then he stopped by here. After we all partook of a few longnecks, he mentioned that his readers might like to hear about Purgatory Cove. Mentioned something about it being “how the other half lives” or something. Sam wasn’t really much for the idea, didn’t want the place overrun with high falutin’ folks wanting all kinds of services and botherin’ him and the rest of the help.